“How can we have a 21st century economy with a 20th century infrastructure?” Vice President Joe Biden recently posed this question to an audience at the American Association of Port Authorities (AAPA) annual meeting in Houston, Texas. He went on to say, “the greatest economic power in the world needs the most dynamic port system in the world.” I happen to agree with this statement. We must find a better way to manage the funding needs of our marine transportation infrastructure. In fact, you will find many politicians, business leaders, economists, and transportation specialists that are quite outspoken on this matter. It seems everybody talks infrastructure, and how deteriorated our roads, rails, highways, bridges, and ports have become. But all these fundamental transportation systems are still continuing to deteriorate. We were all encouraged by the passage of the Water Resources and Reform Development Act of 2014 (WRRDA), and the acknowledgement by substantial votes in both the House and Senate that our ports and waterways need additional investment and more resources to maintain the channels, harbors and waterways. A lot of effort went into educating the large number of House members that had never experienced or even heard of a WRRDA bill. The WRRDA bill authorized improvements to several deep-draft ports, and authorized a phased-in funding approach of the Harbor Maintenance Trust Fund for maintenance dredging of ports and harbor infrastructure. But this has not solved the problem, and we still have 20th century infrastructure, not able to support our 21st century economy. How can this be, you might ask? WRRDA authorizes Congress to implement these funding approaches, but it does not mandate this investment strategy. The Appropriations Committees must actually make the decisions on how these navigation infrastructure projects will be funded. What makes the lack of funds for maintenance of the ports and harbors even more frustrating is the fact that Congress, back in the 20th century, 1986 to be exact, passed a WRDA that established the Harbor Maintenance Trust Fund. The Harbor Maintenance Trust Fund and its Harbor Maintenance Tax were authorized in the Water Resources Development Act of 1986, P.L. 99-662. The purpose of the Tax, a 0.125% ad valorem tax levied on cargo imported or domestically moved through federally maintained channels and harbors, is to pay for Army Corps of Engineers operations and maintenance dredging. The Tax is collected by the Bureau of Customs and Border Protection and directed to the Trust Fund. However, the monies are not immediately eligible for dredging activities. Those monies can only be spent if the funding is actually appropriated by Congress. The Trust Fund has continued to increase and now has a surplus in excess of $8 billion dollars. The reason for the large surplus is that only a little more than half of the annual revenues collected are appropriated for maintenance of the harbors and ports. Last year, $1.6 billion were collected, but the Corps was only reimbursed $979 million. So, since 1986, the shippers have been paying a tax that is supposed to fund the maintenance needs of Federal ports and harbors. But, it has not worked out as authorized by the law. One could quickly conclude that we have been in port infrastructure denial. There is no easy way to resolve this as long as the Harbor Maintenance Trust Fund monies for maintenance must be appropriated and subject to the political vulnerabilities of the current budget process. I keep wondering why we would want to subject our ports and waterways to this burden of political process and continued uncertainty. For the most part, these Federal navigation projects have gone through a rigorous economic evaluation, public comment, environmental compliance review, and in many cases, hundreds of millions of dollars have been invested to develop these ports and waterways, and yet these projects only receive a percentage of the actual maintenance dollars they need to keep the channels at full project dimensions (width and depth). These ports and waterways serve us all, and are the lifeblood of our economic engine. Why would we want to allow them to deteriorate, and not be able to receive the commodities we need, and to export the grain, coal, and manufactured goods that make our Nation strong? We must find a way to keep our ports and waterways fully capable of supporting the increasing flow of goods efficiently and ensure our ability to compete in world markets. It is time to legislate solutions, not just continue to talk about how bad our maritime infrastructure has become. It will be challenging and it will require bipartisan support. Early on, in the 114th Congress, we are hearing discussions about our highway infrastructure, and the need for a tax increase. To hear this rhetoric from leadership gives me hope that maybe a 2016 WRDA can offer a solution that will not just kick the infrastructure can to another day, or pass the responsibility to another Committee. There is a solution. 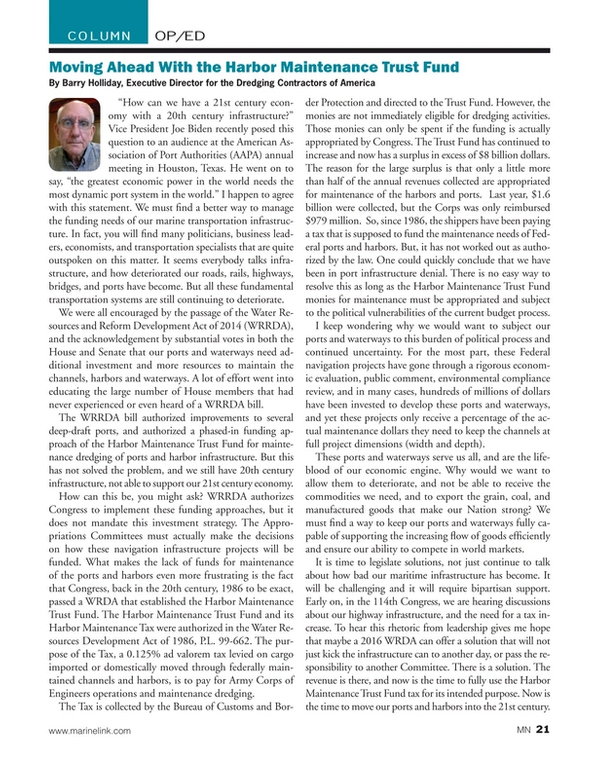 The revenue is there, and now is the time to fully use the Harbor Maintenance Trust Fund tax for its intended purpose. Now is the time to move our ports and harbors into the 21st century.